Juli Wood plays alto, tenor, and baritone saxes, and she loves to sing! She has been lucky enough to play with some great jazz veterans including Melvin Rhyne, Earma Thompson, Jodie Christian, Ira Sullivan, Barry Harris, and Ted Curson. 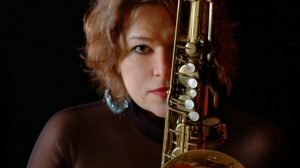 She has entertained around the world at jazz festivals and clubs and, stateside, she has played extensively throughout the midwest. Her home is now in Chicago. Don’t miss this rare Phoenix appearance!